Tell us about yourself: I am interested in finding a new home for a Dutch Shepherd that is a dogsitting client of mine. Photos and video available on request. Seeking Active Companion Dutch experienced home for this dog. 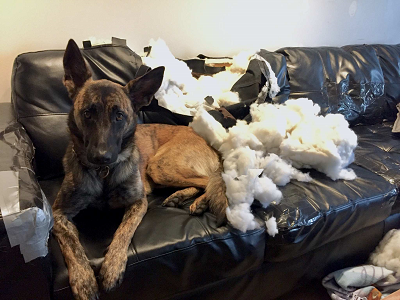 Rear limb amputee Dutch Shepherd seeking an active companion home with breed experience. Great with other dogs of all sizes, but can play rough. Does not take issue if another dog corrects him or acts dominant. Very placating and responsive to other dog's cues. This dog belongs to a dogsitting client of mine; however he's with me almost as much as he is with her. She is moving back to FL in May and cannot take him with her. We are seeking an active companion home for him. During his dogsitting stays with me, I have seen him interact appropriately with every dog he has encountered. Good with very dog savvy cats. He will react if a cat is aggressive to him, but calls off easily and doesn't start trouble unless the cat does. He has been in our home numerous times with even tiny kittens and has no issue with them. He is housetrained, does not need a crate. He does best when he has dog companions to keep him company. Does well on a leash with the use of a correction collar. Rides wonderfully in the car. He does not test a 4' fence. He has a decent foundation of sit and stay and will leave it and "give space" when asked. He can be a bit of a close talker and wants to stick his large head into everything his handler is doing. Hence the "give me space" command. His recall really could use some work and if allowed to get to a very excited state, he can get mouthy. He does not bite, he just puts his mouth on your arm or leg. Very responsive to being told not to do this. For this reason, we are seeking a breed experienced home. Yoda responds best to calm and firmly delivered commands and reprimands. He can bristle if one is too harsh with him. With consistent and fair leadership, he is a dream; and much easier and less handler hard than this breed can often be. While I've seen no specific drive in Yoda for working, he is a very active companion despite missing a limb and would be a good fit for an active person looking for a milder dog in this breed. He can easily hike 3-4 miles with me over moderately strenuous terrain with no issue. He navigates stairs up and down without issue. He has no physical limitations being a three legged dog and requires no special assistance. I recommend a lot more work with him on recall though before anyone lets him off leash. Can operate great as a member of a dog pack - even small dogs. I have 3 male dogs and he is wonderful with them, even the punk Border Collie. He eats just fine with everyone all together in the same place. In fact, if separated in a different room, he won't eat. He prefers to be in the company of other dogs. Yoda will give a big scary bark when visitors come to visit, and while alert and watchful, he is extremely welcoming to visitors. Whether his handler is present when the person enters or not. Not much of a protector, but at least he barks. I have not experienced him with children other than those we encounter while hiking. Despite his usual clownish nature, he turns into a big ball of canine goo when children interact with him. He seems to really enjoy kids and is quite gentle with them. Again, though I have no experience with him living with children. If interested in Yoda, please email eley.rae@gmail.com. I am assisting his current caretaker in screening homes. I e-mailed the person to find what happened to the dog.